When war broke out in 1939, few knew that they would soon be fighting to survive, let alone how or when it would end. 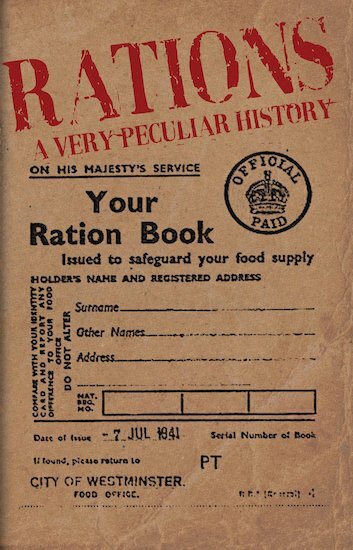 Rations: A Very Peculiar History looks at the measures the British government took to ensure the wellbeing of its people, and how the British public coped with the tough conditions they found themselves in. With some stealing, some hoarding, but most just trying to get by, it was one of the bleakest periods in British history. But there’s a reason they talk about “the Blitz spirit” – and this book features amazing tales of camaraderie and good humour in the face of bombing and hunger. Featuring food-and-energy-saving recipes of the time, along with quotes from survivors and fascinating ephemera, this book will transport you back to a time when even Buckingham Palace and the Ritz hotel weren’t above swapping venison for lobster to make do!